This is my address at the Jisso Center 25th Anniversary Celebration Ceremony titled, "Bright Future Is In Our Hands." 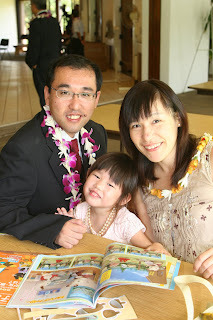 As we conclude the Jisso Center 25th Anniversary Celebration Ceremony, I, as Acting Chief of Seicho-No-Ie Hawaii Missionary Area, would like to address about how we can proceed toward a bright future. Throughout the speeches presented at this ceremony, I could understand how the construction of Jisso Center was planned and built, and learned that the loving thoughts of many predecessors including Dr. Masaharu Taniguchi, and the fruits of their efforts, sweat, and gratitude led to the construction of Jisso Center and made the Center what it is today. I would like to extend my sincere gratitude to every one of them from the bottom of my heart. One of the three major principles of the Seicho-No-Ie teachings is the phenomenal world is a reflection of our mind. It means that our physical body and our destiny are a reflection of our mind and it also means that this building is a reflections of all concerned who worked on its design and construction. 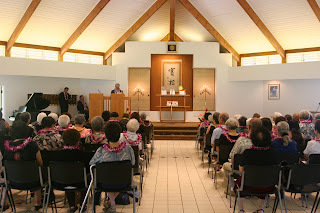 Therefore, the loving thoughts of Dr. Taniguchi are resounding, the loving thoughts of International Headquarters are permeating, and a sense of gratitude and joy of all those were enlightened by attending spiritual training seminars and other events held at the Center are resonating throughout the facility. Since the Center is filled with a vibration of joy and gratitude, loving thoughts, everyone who attended an event here is aware of being a child of God, is reborn, and manifests the will of God, which will finally lead to the basics of true world peace. 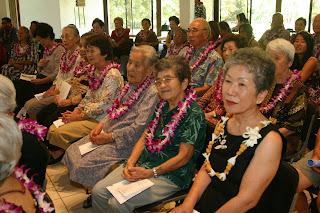 Throught the dedication of those with a deep awareness of the Truth of Life, and a strong desire to illuminate the life of all humankind, there are many "Seicho-No-Ie" families in Hawaii. Those members sincerely respected and entrusted in Dr. Masaharu Taniguchi, put his teachings into their daily lives, and happily shared the teachings with families, relatives, neighbors, communities, and others. Dr. Masaharu Taniguchi single-mindedly desired the happiness of all mankind, and the grand harmony of the whole universe, totally devoted himself to God's Humanity Enlightenment Movement, and advanced to a high spiritual world in 1985. His desire was sincerely conveyed to his successor, Rev. Seicho Taniguchi, President of Seicho-No-Ie, and the desire is now conveyed to Rev. Masanobu Taniguchi, Vice President of SNI. This transition should be worthy of note. Then, SNI International Headquarters discussed how to realize Dr. Taniguchi's desire, that is to say, to propagate the teachings to all mankind, and reached the following conclusion: to promote the movement to disseminate the teachings throughout the world in English. As you already know the number of English-speaking population is said to be 1 billion or 1.5 billion worldwide and the language is spoken all over the world. On the contrary, Japanese, the language of SNI's birthplace, is only spoken by 130 million people. If we wholeheartedly want to promote God's Humanity Enlightenment Movement ---- this is a movement to brighten the thought of all human beings ---- we must spread the teachings in English. International Headquarters pondered that it is essential to propagate the teachings in the United States, the country that has the greatest impact on world economy, politics, and all fields, and it is the only way to realize the will of God and the will of Dr. Taniguchi. 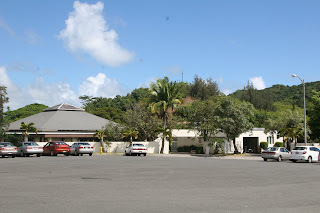 The Headquarters named the movement "International Peace by Faith Movement" and started it in 1993. Based on its concept, the International Spiritual Training Center was established in New York, and the International Spiritual Training Seminar or ISTS which is aimed mainly at new- comers started in 1995. ISTS is also an opportunity to nurture leaders to shoulder the propagation in English. Among the 44th ISTSs held so far, Jisso Center offered its facility to 6 ISTSs and welcomed attendees from all over the world. In the ISTS, we are taking unprecedented steps in the history of SNI. One of them is a change in the rituals and ceremonies. Since SNI was founded and spread in Japan, the procedure of rituals and ceremonies were in line with the Japanese cultural background. To put it simply, SNI adopted the Shinto style because it is the least controversial. In this regard, Dr. Taniguchi taught that "there are no so-called Seicho-No-Ie ceremonies." Rev. Masanobu Taniguchi gave further explanation on this matter as follows: "Notwithstanding the worth of these ritualistic manifestations, the Truth ---- God's message to us which lies behind them ---- far surpasses these manifestations in importance." Shinto style rituals may be favored by some westerners or others who like the Japanese culture; however, they are not favored by people in China and Korea, and they are not necessarily accepted by the average Americans or Europeans. Therefore, to fit the rituals and ceremonies to the American people, leaders in the U.S., purposely excluded Japanese leaders, and fully discussed and decided to remove the bow and clap when worshipping God. 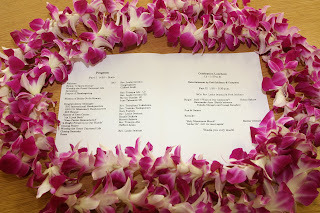 This new method was adopted by the ISTS from the beginning and we started to use this method at English seminars, services, and meetings since this June in the Hawaii Missionary Area . Please note that these changes have been made to have Dr. Taniguchi's magnificent dream come true, the dream ---- to convey the teachings to all human beings. And also to practice the following teaching; "To express life, a form is always necessary; however, at the same time, we must throw away that form of expression. The same applies to Seicho-No-Ie." Moreover Dr. Taniguchi contributed to our society, nation, and the world by putting the teachings into practice. The same things are being done by the President and Vice President. What humanity has to deal with urgently right now is the issue of global environment. Nowadays, almost everyone raises this issue including presidential candidates; however, Rev. Masanobu started to touch upon this matter more than 15 years ago. What a foresight he has! Furthermore, SNI is not just a global environment preservation group but a religious group to educate everyone that the whole universe is a manifestation of the life of God. By raising an awareness among people that everything is a manifestation of the life of God, and being a role model for religious practitioners, we believe we can contribute to solving this environmental problem and bequeathing this beautiful earth to the next generation. In this way, what SNI International Headquarters is carrying out is nothing more than the application of what Dr. Taniguchi taught for this day and age, and when we unite together in harmony based upon their policy as an international family of Seicho-No-Ie, I believe our movement will catch a wave and grow and grow in intensity. The points I would like to address here is to have you understand correctly what is going on now, return to the basics wholeheartedly, and create a new movement in accordance with the guidance from the current leaders. By doing so, I believe our future becomes much brighter and we can change the world as it should be because we have so many wonderful members and friends in Hawaii and we are all children of God with infinite power and potentiial. This concludes my remarks. Thank you very much for your kind attention.